Orgill, Bransty, Moor Row and Black Combe schools are hosting Silent Soldier silhouettes in their grounds as part of a community project. Their pupils – and those from eight other West Cumbrian schools taking part in the project – will now research their local war memorials and contribute a poem, short story or drawing to an upcoming exhibition, A Brave New World: the Armistice and Beyond, at The Beacon Museum, Whitehaven. The four Royal British Legion silhouettes have been funded by Copeland Borough Council, and following their spells at the schools, they will be moved to public locations across the borough, before all arriving at The Beacon Museum in advance of its Remembrance Sunday events. Julie Irving, Headteacher at Moor Row and Orgill schools, said: “This is a fantastic opportunity for the schools and I would like to thank Alan Gillon and staff at The Beacon Museum for involving us. 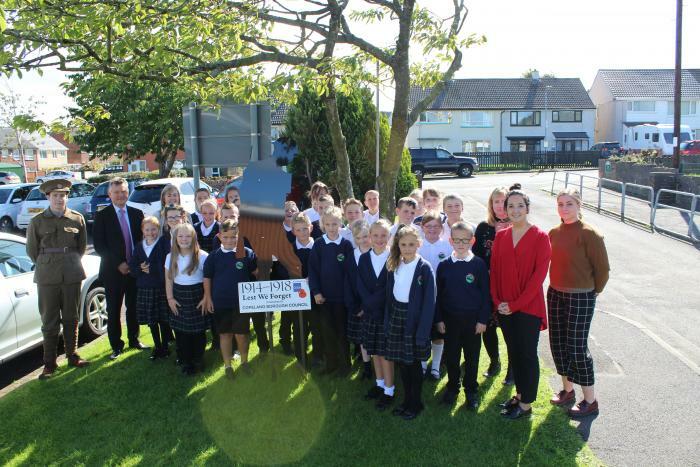 “Both schools are at the heart of their communities and it is important that our pupils recognise the role that local people had in World War One and what life was like in the years that followed. Mike Starkie, Mayor of Copeland, joined Alan Gillon and Matthew Bland, from The Beacon Museum, to deliver the silhouettes to Orgill and Moor Row Schools and to introduce them to the Remembrance project. Mr Starkie said: “As a council, we’re proud to support the Royal British Legion by purchasing the Silent Soldiers for public display. A Brave New World: the Armistice and Beyond runs from October 6 to November 11 and will tell the diverse stories of individuals’ and families’ accounts of war – both familiar and surprising – that profoundly changed the west of Cumbria. The personal letters, diaries and artefacts that will be on display show the love, excitement, fear, bravery, humour, grief, loss and longing that touched the lives of thousands throughout the area. The community project will also involve the school pupils creating over 1,000 poppies from recycled material that will go on display at the museum over the Remembrance period. Members of the public will also have the opportunity to create their own poppies at the museum to contribute to the display. For more information, telephone 01946 592302 or visit www.thebeacon-whitehaven.co.uk.